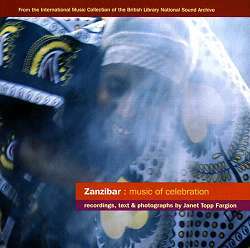 This CD is drawn from recordings made in Zanzibar during doctoral work by Janet Topp Fargion, who supplies the very helpful annotation. She states that ‘most of the tracks are excerpts from much longer events. They are presented here as much for their musical interest as for their atmospheric quality. Together with these notes, they are perhaps best heard as a documentary'. This seems unnecessarily modest, as well as not very clear; can a performance without much atmospheric quality be of much musical interest? In practice, the material seems to me to have atmosphere a-plenty, both by virtue of being well recorded, and as the vibrant product of a lively culture. It is clear that the selected tracks seek to display the range of Zanzibari music, save for muziki wa densi (mainland-influenced dance band music), and in that sense the disc is indeed documentary; but it’s also stimulating and very enjoyable listening. The opening track, a rare collaboration between Zanzibar’s two leading musical clubs, is an example of traditional orchestral taarab, played by a large ensemble, and heavily influenced by the aesthetics of Egyptian and other Middle Eastern music. It’s followed by Mwambieni, which features changes of tempo, and a transition from a traditional taarab rumba to the local unyago rhythm, which is associated with the women’s sexual initiation dance called kiuno. These aspects of Mwambieni illustrate recent changes in the aesthetics and performance practice of taarab, which seem to have been a consequence of the foundation of Culture Musical Club in 1965, at the instigation of the revolutionary government. Culture Musical Club brought together musicians from the poorer suburbs (ng’ambo - literally ‘over there’) of Zanzibar Town. Many of them had previously been playing for women’s groups and in kidumbak ensembles, and as a result, taarab began to incorporate elements from both these musical spheres. Taarab ya wanawake (women’s taarab) has always been much more earthy and lively than the cooler art music of the men’s orchestras, even though the women hire those same male musicians to accompany their songs (in smaller, and therefore cheaper, ensembles). Sentimental, romantic themes are replaced by lyrics called mipasho, which use both ironic and direct language to comment on the personal lives of others. The direct language is frequently abusive, and some of the songs were so strong that they led to fighting, which resulted in the government instituting a censorship board! Topp Fargion observes that ‘lyrics used by women’s groups are milder as a result of this intervention, but accusations of prostitution, illicit love affairs and the like are still very much the favourite.’ It makes one wonder what the pre-censorship lyrics were like. The whole subject of gender roles and relative power in taarab is a complex and fascinating one, and it will be obvious that the outcomes are often far from what might be expected in a country that is 96% Islamic. Kidumbak is a small group music, which began during the twenties among ng’ambo musicians, who could not afford the instruments of traditional taarab. At first, the accompaniment consisted only of the two kidumbak (small drums) which gave the style its name; later, one or two violins, and various percussion instruments, were added, together with the sanduku, a one-string tea chest bass, which is primarily the provider of a rhythmic pulse, rather than functioning harmonically or melodically. Kidumbak is played at weddings, uses the hip-twirling kiuno rhythm, and bases its repertoire on that of the taarab orchestras; but the taarab songs are shortened, the tempi are increased, and there is a concluding mchapuzo (fast section), which is ‘designed to get the women dancing'. These michapuzo (plural) are structured as couplets and refrains, rather than using the strophic forms of taarab; this facilitates improvisation which, as in the women’s mipasho, often concentrates on the private lives of members of the audience. This use of improvisation means that kidumbak is not amenable to censorship which, of course, is one reason for its popularity. There has been a considerable, and quite complex, back-and-forth traffic among the styles, rhythms and repertoires of the various musics, a set of processes which is discussed in the notes to this CD, and in those to successive issues on Globestyle. The general tendency is clear, though; influenced by the preferences of the women who are its main consumers, taarab in general has been moving increasingly towards the livelier rhythms and subjects of kidumbak and taarab ya wanawake. The present CD is especially useful, in that it brings the different genres together on one disc for ease of comparison. Wide-ranging, well annotated, and well recorded, this CD is an important addition to the available recordings of the music of Zanzibar, and will be of great interest, as both documentation and entertainment, to newcomers and more seasoned listeners alike.